Once in a Blue Moon a band comes along that are really something special, and Argentina's 'Geishas In Vitro' are such a band. With a quite unique sound that blends the influences of early Queen and the more contemporary artists such as Muse and Radiohead then mixing that all up with a South American approach which makes for as stunning a debut album as I've ever heard. Now that's a lofty claim certainly, but one I believe very well deserved. After an EP release some 18 months back and now with said debut album safely under their belts I felt it only appropriate to find out what makes the boys from Argentina tick. 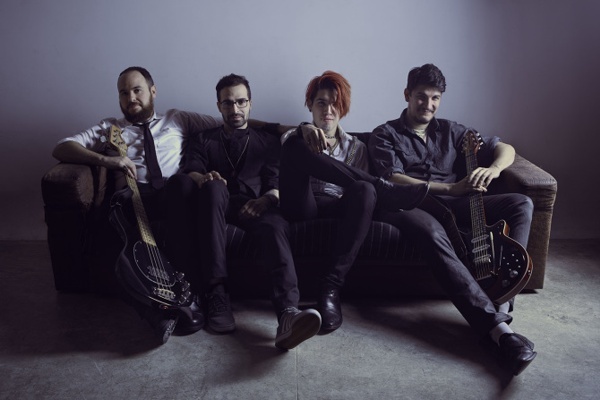 So via a surprisingly good Skype link to Buenos Aires I caught up with band members Matias Merçeauroix, Ignacio Crosta, César Barabino and Giuliano Sánchez to discuss all things Geisha related and more. You seem to have come out of nowhere, but obviously there's some kind of history involving the band, so tell me how did you all meet and how long have you been together? We've been playing together for about 10 years or so now and we had a Queen tribute band first and rather than playing all the hits we dug deep into their catalogue and played their 'Deep Cuts' instead , people always wanted the hits but we never played them!!. We all played in other bands too, mostly, but not all tribute bands but this was all before we decided to put together our own group which had a shared vision. In the past Matías (Vocals) played and recorded for many bands and myself, Cesar (Guitar) played and recorded with a local Ska band (Matias also played and recorded with them but we never shared the same timeline). Ignacio (Bass) recorded an as yet unreleased album, and Giuliano (Drums) participated in many funk and rock projects too. So by the time we got together we had a couple of our own songs already, we then started to write even more original material, and from there is started to develop very naturally, and so for the last two years we have been working as 'Geishas in Vitro'. The band's name, the quite exotic 'Geishas in Vitro', where did that come from? We had a lot of discussion about the name and we couldn't agree on anything, but it comes from a number of places actually. If you're familiar with the film 'Velvet Goldmine' which is about a Bowie like rock star in the 70's, the film featured a band called 'Venus in Furs' and Bowie himself had 'Spiders from Mars' and we liked the idea of a band name that had 3 words, so being huge Queen fans, we took inspiration from the lyrics of 'Killer Queen' and 'Let Me Entertain You' and we ended up with 'Geishas in Vitro. So, after we had deciding on the name we checked around and found it was still globally available!, It's a weird name but we think everyone can understand it, and so we went with that. You've already mentioned Queen and Bowie, so who have been your main influences? Well, yes of course Queen, but we only took some elements of their music that we liked the most, and we listened to other bands too, but we also listen to new music as well, and we know the end result will sound a lot like Queen particularly with the vocals and some of the guitar parts. We do try to move away from that Queen sound as well and create our own individual sound and identity which we think comes very organically to us, but we were very conscious of what we took from bands such as Queen and at the same time try to be very different from them. Now I'm no expert when it comes to the Argentinean rock scene, can you enlighten me on what it's like right now for bands such yourselves? There is a rock scene in Argentina but most of the successful bands are probably ones that play a more 'Classic Rock' style such as what the Rolling Stones play, and there are of course a lot of underground bands. The main difference here in Argentina is that there is a bigger gap between the big bands that can fill stadiums for months on end and then there are all the others. Here there are probably more bands than people that want to go and see them play! And those bands have to work really hard as there are not many venues either. Also, these places want you to pay them to be able to play so it's all very different from, say England where there seems to be plenty of bands and places for them to play. The scene here also doesn't seem to want bands that sing in English or any other language other than Spanish, which is why the album was done this way, we know how it works here and how difficult it is to break out and have success. What were (if any) your aspirations for this album, was it aimed solely at your home market or was it to get it out to a global audience? Putting it simply, we want it to get to as people as possible of course, but by the end of the recording process we just wanted to finish the album as it had become a bit of a mess (laughs). It took us so long to get it all done, and when we get to do our second album we are going to know how to do things better and quicker! With this record we wanted to show people what we can do, so it was a challenge for us. We had to deal with so much as we did it mostly by ourselves and we did have some help from our good friend Ramiro Cerar in the mixing and recording of the album. We have learned so much from this experience. You know we had to discard so much material as we recorded just about everything, we could probably have put out another album worth of just the outtakes! With regards to the album, you seem to have come up with a big and very dense, layered sound. Presumably this was all done on a tight budget. Thank you, yes we used all our own money, with no outside investment. We didn't go down the traditional route of recording; it would have been so much simpler if we had had a lot more money and the use of a bigger recording studio. We used our own home studios for most of the recording apart from the drums, and when it came to finally mixing the record we had so many things that we wanted to put into the songs that some of it got a little lost but we just made the very best record we could with what we had. With regards to 'Terradio' it was written with (firstly) ELO in mind and with also a little Jeff Buckley too but then we watched the David Bowie film 'The Man Who Fell to Earth' where there is a scene in which Bowie is watching many TV's in his room at the same time and we thought that scene was so cool and it was that which was the final inspiration for song. With 'Noanleos' I wanted to come up with a song with invented words. In fact the word 'Noanleos' doesn't mean anything, it's a made up word! !, and I wanted to do the whole song like that, but I also wanted to write it in Latin. It's strange that when we laid down the drums for the track, we really didn't have a song! !, we just had snippets of bits and pieces , but it came together at the very end of making the album, in fact a lot of ideas came to us at the very end. Another song on the record 'Criminal', with its beginning being very different from the rest of the song, we had that intro hanging around for a long time but only got round to recording it at the very last moment!, but right up until the very last minute anyway we were still deciding upon lots of different things and It all got very crazy. We all in the band have very high expectations but we had to learn with this album when to let go of things and say it's finally done. So who comes up with the song ideas, is it a group thing or does everyone have a defined role? We essentially gathered up all the ideas we had, and they all came from different places, but we tried to make them as a whole, and it was a very democratic process, very much like Queen in their later years, you know when someone would come in with an idea and they would present it to the rest of the band. The lyrics would come from the original composer but then the rest of the band would work on the song. With the new songs we are writing right now we are trying to be even more democratic and we work more together from the core of the song, from the embryo of it, with less pre defined ideas. You also decided to rerecord 4 tracks from the initial EP, were you happy how they came out on the album? We weren't sure at time if it was worth it, we were going backwards and forwards with them, and when we were mixing we thought, is it worth the trouble, and are we really making them better? We've got mixed feelings about that and sometimes you always think that the original is better, but we felt that the songs we rerecorded did fit really well with the theme and flow of the album. We also decided to leave off 'Lola' which was also on the EP and incidentally the very first song we ever wrote together, because it just didn't seem to fit with the rest of the material. Finally, do you see that being a rock band from Argentina working as a disadvantage or advantage for you...and of course what are your immediate plans? Sometimes we think it can be an advantage as there are no other bands here in Argentina doing what we do, and we are still working out how to get people to listen, but to promote it outside of Argentina we have had some talk about recording some songs in English, which could be beneficial for us, not all of them of course but certainly 2 or 3 tracks. Here in Argentina people put a lot of importance on the lyrics which is why they are sung in Spanish. This last month we have been working on how to promote the album and looking at different marketing strategies and singing some songs in English is certainly one of them.